Summer 2017 is long gone by now, but this past summer was yet another BRILLIANT one filled with talented young goalkeepers, passionate staff, hard work, sweat, and lots of laughs! To fully appreciate what I mean you need to attend a camp or watch a session to truly understand how unique the chemistry is at our camps. This chemistry is inclusive, meaning students PLUS staff. We ALL work hard, and we ALL have FUN in the process. WE STRIVE TOGETHER! To me that is what this game is about, competing hard to be our best WHILE enjoying the process. It is the bonds that persist after camp is long over. The excitement in a student’s eyes when they reunite with a friend from a previous camp. And the long term support network of current students, former students, and staff coaches who all look out for each other and support each other in their struggles and successes. There is always someone there to pick you up, to lean on, and to cheer you on. Quite simply what we have at Dynasty is unique and very special to me. You are all my family. CONGRATULATIONS to 2017 student Marzia Josephson for topping all the Fitness Rankings this summer! She was at the top of our Overall Physical Ranking, Overall Distribution, and Overall Combined Ranking, at age 16 this is quite a feat! Want to see more? Check out all the KILLER saves and HUGE smiles in the 2017 Photo Album! Dynasty Goalkeeping is NOT just a summer camp. The 2017/18 Dynasty Winter Camp locations and dates have been set and are now open for registration! Space is limited, so if you are looking to stay sharp over the winter I would encourage you to sign up ASAP! Click on the corresponding banner to register! After a standout collegiate career at the University of Connecticut, Dynasty alumni Emily Armstrong has landed in Harstad, Norway! After gaining experience and training on trial with NWSL club Washington Spirit during the spring she signed on to play with Norwegian club Medkila IL. 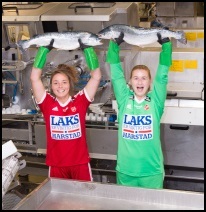 Medkila IL competes in the Toppserien, the first tier of Norwegian women’s football. Coincidentally Medkila is the club that former Dynasty student and University of Washington graduate Megan Kufeld tended goal for in 2016. Looks like we have a Dynasty pipeline getting started to Norway! Want to learn why Emily is hoisting fish and learn more about her experience? Check out her detailed blog “Armstrong Abroad”. In her second season playing professionally for NWSL Sky Blue FC, the William & Mary graduate Caroline Casey found herself backing up Canadian international Kailen Sheridan for the majority of the season. However, when given her opportunity to start late in the season against the Carolina Courage, Casey made the MOST of her opportunity. 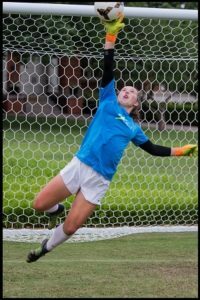 Caroline made six saves in the 1-1 draw earning Player of the Week honors from Front Row Soccer as well as one of her saves being nominated for NWSL “Save of the Week”. I love how calm she stays on breakaways, closing down the attacker, staying big, and reacting! More clips for that game and an impressive difficult low diving save can be viewed around the 1 minute mark of the SkyBlue/Courage match highlights. Dynasty legend and NWSL pro Britt Eckerstrom has had the rare experience of playing for 2 clubs in 2 seasons and won 2 NWSL Championship Titles! In 2016 upon graduation from Penn State University Britt was drafted to the Western New York Flash where she played behind Canadian international Sabrina D’Angelo (3 appearances her rookie season). Early in 2017 the Western New York Flash relocated and became the Carolina Courage. In March she was traded to the Portland Thorns where she was the reserve to NWSL Goalkeeper of the Year Adrianna Franch. While she didn’t see any game time this season, she gained tremendous experience training with former German National Team goalkeeper Nadine Angerer who is currently the Thorns goalkeeper coach. Additionally she was competing daily in training against her teammates many of whom are top internationals…maybe you have heard of some of them??? Tobin Heath (USA), Amadine Henry (France), Lindsay Horan (USA), Allie Long (USA), Megan Klingenberg (USA)m Nadia Nadim (Denmark), Hayley Raso (Australia), Christine Sinclair (Canada). Not sure you can get a better training environment than that as a goalkeeper! Certainly though match experience is critical for our development as a goalkeeper, so with that in mind Britt recently signed to play for the Newcastle Jets of the Australia W-League over the NWSL winter off-season. This will be a great opportunity for her to get some much needed match play! And coincidentally fellow Dynasty alum Kelsey Wys played for the Jets last winter before injuring her ACL. Have fun down under Britt! Congratulations to former Dynasty student and staff coach Adelaide Gay on winning the Icelandic Championship in her first year with IB Vestmannaeyja. I strongly recommend you watch the highlights from her performance in the Icelandic Cup Match . She had a heroic effort and made some epic saves to keep her team in the match! IBV prevailed winning 3-2 in overtime! Kelsey is still with the Washington Spirit and has spent the season recovering from her torn ACL that she suffered December of 2016. We hope to see her back between the pipes next season! SMU junior goalkeeper Catie Brown was named the American Athletic Conference Goalkeeper of the Week as she recorded 10 saves against 31 shots faced in 209:54 minutes of work, as the Mustangs posted a 1-0-1 mark on the first road trip of the year to remain undefeated. In a 1-1 draw at Gonzaga, the Sacramento, CA, native recorded nine saves against 21 shots faced. The junior followed up the strong performance with one save in 10 shots faced in the 2-1 overtime win at Washington. This is her first career player of the week honor. After redshirting her 2016 season while competing with the U20 USWNT in the U20 Women’s World Cup, Rose (RS junior) has returned to competing in between the pipes for the Nittany Lions at Penn State. 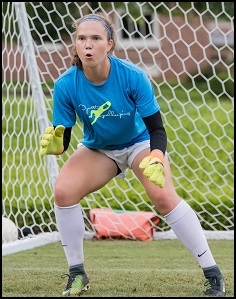 While she has regained her starting role from teammate sophomore Amanda Dennis (also a US YNT pool gk) who started in 2016 in her absence, the two goalkeepers have created a positive training environment striving together to be their best. They are a great examples of how competing WITH each other in practice instead of competing AGAINST each other is a better solution for the individual and team. 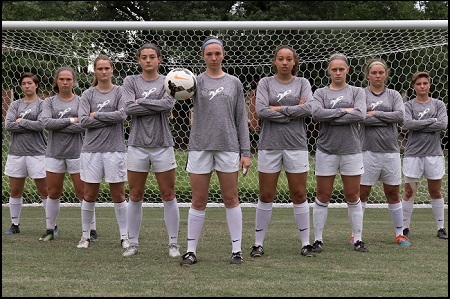 This article from PSU Women’s Soccer website details their unique challenge as two very talented goalkeepers on the same college squad. Following a nine save, two shutout weekend, Kansas senior goalkeeper Maddie Dobyns garnered a pair of weekly honors for her efforts. The Big 12 Conference named her its Defensive Player of the Week, while Top Drawer Soccer added her to its ‘Team of the Week”, which highlights the top 11 players from the last week of collegiate soccer action. Dobyns, a native of Kansas City, MO, was key in the Jayhawks’ undefeated weekend as they topped Tulsa (2-0) and Oregon State (2-0), both on the road. She collected nine saves on the weekend, which included a six-save effort against the Beavers Sunday, as she and the Kansas defense posted a pair of shutouts. Dobyns’ biggest moment of the weekend came in the 68th minute against Oregon State, when she stopped a Beaver penalty kick attempt to preserve the Jayhawk lead. The senior has now gone more than 291 minutes since conceding an opponent goal. A BIG congratulations to long time Dynasty student/staff coach and Western Michigan University senior Stephanie Heber on breaking the program record for career shutouts with her 27th after making five saves on the night in the 1-0 win over Wright State. Salisbury University senior Hope Knussman was named the Capital Athletic Conference Defensive Player of the Week. The Sea Gulls played just one game last week at the University of Mary Washington, but Knussman stood up to every offering from the Eagles, making four saves in a 1-0 CAC victory to achieve her second shutout of the season. Knussman is one of six CAC goalkeepers who have not allowed a goal in conference play, while she has made five saves in league play. August 8, 2017 – South Carolina sophomore Mikayla Krzeczowski was named to the 2017 Women’s MAC Hermann Trophy Watch List, the annual honor that recognizes the top women’s soccer player in NCAA Division I. Krzeczowski shined in net her freshman season posting the program’s lowest single-season goals against average (0.43) and notched the most shutouts ever (11) by a Gamecock freshman. Eight of her 11 clean sheets came in SEC play, and she also collected shutouts in NCAA Tournament victories over No. 20 Colorado and No. 4 BYU. Krzeczowski conceded just three goals in conference action en route to All-SEC First Team honors. September 11, 2017 – Krzeczowski earned another SEC Defensive Player of the Week accolade in back-to-back weeks after her 4th clean sheet of the season over the Clemson Tigers. Four of her five stops came in the first half against a Clemson team that entered Friday’s contest unbeaten on the year. A little over a month later, only a few weeks into her freshman season, Malham earned her FIRST honor as an Ohio University Bobcat. She was named Mid Atlantic Conference Defensive Player of the Week. Malham was a brick wall helping Ohio to a 2-0 weekend to start MAC play. In total, Malham played all 180:36 minutes in net, allowing one goal on 15 shots on goal faced and making 14 saves with one shutout. Malham registered a .933 save percentage and a 0.50 goals against average. On Friday against Eastern Michigan (against fellow Dynasty student Kaylin Williams), Malham held the Eagles scoreless until the 70th minute when EMU took a 1-0 lead. Malham held steady though, keeping Ohio in the game to allow the Bobcats to tie the game late and take the 2-1 OT victory just 36 seconds into the OT period. Overall, Malham saw eight shots on goal, while allowing one goal and making seven saves in 90:36 minutes of work. On Sunday against CMU, Malham was solid once again recording her first career shutout as she held CMU scoreless through 90 minutes. Malham recorded seven saves on seven shots on goal faced, leading Ohio to the 3-0 win. 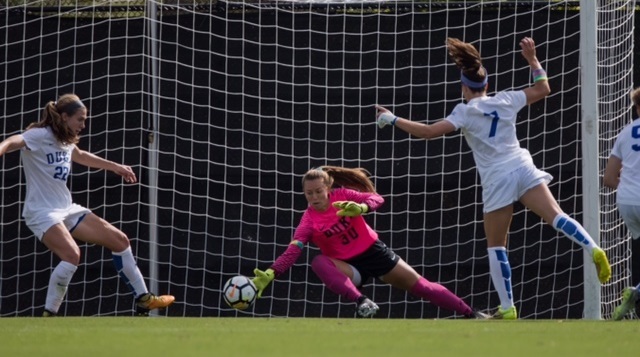 Blue Devil senior and Dynasty staff coach Emma Jane Proctor earned ACC Defensive Player of the Week honors with her shutout performance over the West Virginia Mountaineers recording her 3rd clean sheet of the season. There’s been no indication of any “sophomore slump” for UNC Pembroke’s Gina Ryan! In fact it has been the EXACT opposite! Gina stepped up her training with Dynasty starting last spring and attended a week of camp this summer as well to help elevate her game. Well her hard work is paying back HUGE dividends this fall! Gina started off the season being named Peach Belt Conference Pre-Season All-Conference in August and has followed that up with back-to-back Peach Belt Goalkeeper of the Week -accolades on October 9th & 16th. The Black & Gold netminder now leads all PBC goalkeepers in goals against average (0.62) and save percentage (.887), while her five shutouts rank second in the league. Her save percentage ranks 17th in all of Division II and her GAA is good for 39th in the nation. New Jersey Institute of Technology senior Amelia Sapirman was named NJIT Female Athlete of the Week Soccer’s for her performance through September 5 posting two shutouts in the Highlanders first two wins of 2017. Against Marist on August 30, Sapirman recorded her first career shutout in her second start of the season, saving six shots in NJIT’s 2-0 win. Sapirman earned her second consecutive shutout in the Highlanders 4-0 win over Saint Peter’s after grabbing three saves. Following a pair of shutout victories, Eastern Michigan University junior goalkeeper Kaylin Williams garnered Mid-American Conference Defensive Player of the Week honors. It marks the second time Williams has reeled in the weekly accolade in her career. Williams lead the Eagles to 1-nil wins against Youngstown State and Oakland. She totaled eight saves on 18 shots faced and did not yield a goal in more than 185 minutes in between the posts. NC State junior Sydney Wootten earn ACC Defensive Player of the Week honors for her strong play in the net for the Wolfpack. Wooten played all 110 minutes in goal in double-overtime scoreless draw against Virginia and all 90 in a 1-0 win over Western Carolina. She posted back-to-back shutouts and totaled 10 saves on the weekend, including a season-high six against the Cavaliers. 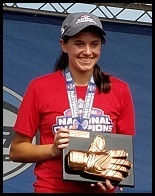 Congratulations to Angelina Anderson of Danville, CA on her consistent performances this year that have made her a mainstay with the U17 US Women’s National Team! The 2017 calendar year is largely an identification year for players at this level in preparation for the 2018 FIFA U-17 Women’s World Cup that will be staged in Uruguay. Angelina was invited into her first training camp May 14-21 at Lakewood ranch, FL and there has been no looking back since. She received her second invite for the next camp, June 2-11 in Chula Vista, CA. She got her first call up for international play when the team traveled to China July to play Japan and Canada. Anderson saw action in the team’s 1-1 tie against Canada. In August she was called back in for a two game event versus England in Portland, OR. Currently Angelina is participating in her fifth event with the team this year at the October 21-28 training camp in Chula Vista, CA. Keep up the great work Angelina! Congratulations to Katherine Asman of Roswell, GA fighting to stay in the ultra competitive National Team Pool. Asman has had invites into youth national team camps since the age of 13 and continues to work to remain in the national team pool. This is no easy task to remain in the pool through every age group! Currently she is in camp with the U18 US Women’s National Team from October 21-28 in Chula Vista, CA concurrent with the U17 US WNT training camp where Angelina Anderson and Ruth Jones are also in camp! Congratulations to Leah Freeman on her first call up to the U16 US Girl’s National Team! Freeman was invited into her first camp in July and made her first international trip roster in September when the U16’s traveled to Germany for two matches. Freeman played the full 90 in the second match of the trip winning 4-0 over Germany. This group of players moved up from the U14 level last year and will spend two years as the U16 GNT before moving on to the U18s. These players are all age-eligible for the 2018 U-17 Women’s World Cup, which has an age cut-off of players born on or after January 1, 2001, but will eventually be the core age group for the team that will attempt to qualify for the 2022 FIFA U-20 Women’s World Cup. Congratulations to Ruth Jones for her continued involvement with the youth National Team Pool. In April Ruth traveled with the U17 US WNT to Italy and she is currently in camp along with Angelina Anderson in Chula Vista, CA (October 21-28). Along with Angelina and Ruth, yet another Dynasty goalkeeper is vying for time in the very competitive U17 US Women’s National Team Pool. Congratulations to Marzia Josephson on getting another call up to the youth National Team, this time to the U17 US WNT camp in Lakewood Ranch, FL. Marzia has been a consistent player in the national team pool from the U15 level at age 14.